← Celtman a few more comments and the wild flowers are out. Skye Sculpture at Sligachan for Mackenzie and Collie pioneers of the Skye mountains. Skye is such a Mecca for the mountaineer and I try to get over a few times every year, I was very pleased a few years ago to read that a sculpture is being built over looking the Skye Ridge a short distance from the Sligachan Inn by the Collie and Mackenzie Sculpture Group. 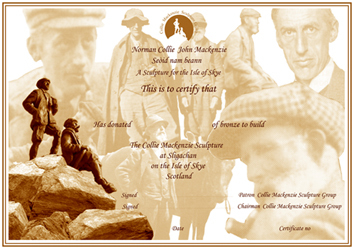 The aim is to commemorate the achievements of Sconser man John Mackenzie and his internationally renowned climbing companion Norman Collie.The certificate below is received when you donate to the sculpture and is a grand idea to my mind. John Mackenzie was born at Sconser on the Isle of Skye, about three miles from Sligachan, which has been the centre for mountaineers and other visitors to the island. When he was 10, Mackenzie climbed Sgurr nan Gillean,and when he was 14, he was with a Mr Tribe on the first recorded ascent of Sgurr a’Ghreadaigh. In 1874, with Alexander Nicolson, he made the first ascent of Sgurr Dubh. In due course Mackenzie,Known locally as Morton,became a professional guide, the first native Scot to do so. Mackenzie’s greatest client, and later life -long friend was Norman Collie, who was described as one of the four greatest mountaineers of his time. Together they were the first to climb another unique piece of rock on Skye – the Cioch, a pinnacle which juts out from the cliffs of Sron na Ciche. 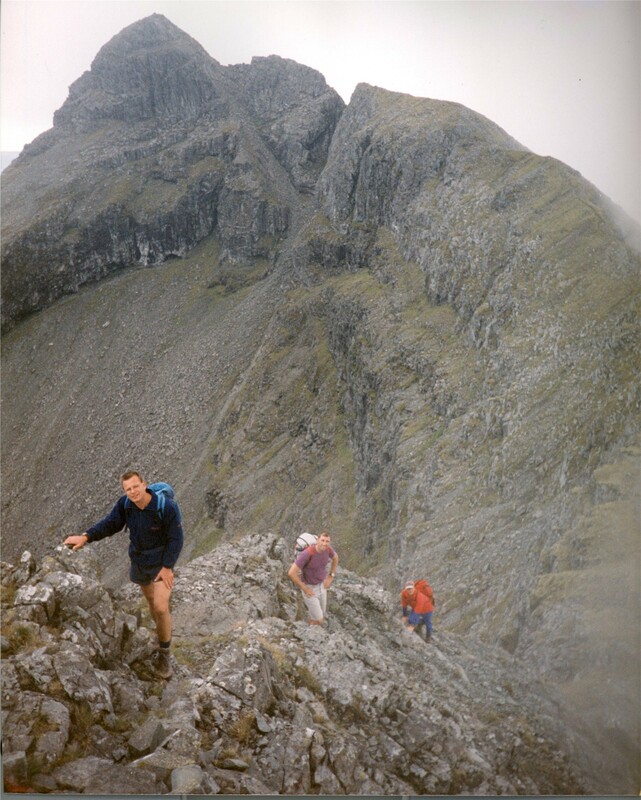 Mackenzie has a Cuillin peak named after him – Sgurr Mhic Coinnich,or Mackenzies peak. In 1887 he was a member of the first ascent party.His friend Collie also has a peak named after him – Sgurr Thormaid – Normans peak. Their friendship lasted until Mackenzies death in 1933.He was buried in Struan cemetery on the west coast of Skye. Collie was later laid to rest in the lair beside his life long friend. Two great men and it will be wonderful when the statue is finished. Whenever I get a birthday I donate a wee bit to the fundraising by getting a wee piece of the monument. I have had so much fun in Skye I look forward to the day when it is complete. This entry was posted in Charity, Friends, History, Mountaineering. Bookmark the permalink.